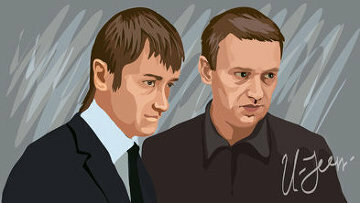 New fraud case opened against Navalny brothers | Russian Legal Information Agency (RAPSI). MOSCOW, April 18 (RAPSI) - A new investigation has been launched against the Navalny brothers, Alexei and Oleg, the Investigative Committee reported on Thursday. According to the investigators, the Navalnys set up a company in Cyprus by the name of Alortag Management Limited, which then founded the Main Subscription Agency, a fraudulent company also controlled by the Navalnys. They appointed a nominal chief executive to this company, who had no part in the Main Subscription Agency's further activities. In 2008, Oleg Navalny, who was a senior executive at a division of the state company Russian Post, signed transportation services contracts with petroleum trader MPK. According to the contracts, the Main Subscription Agency agreed to deliver receipts, blank forms and other paper products. The investigators believe these services were overpriced, which caused MPK losses of at least 3.8 million rubles ($120,000). The money allegedly was transferred to the Main Subscription Agency accounts and embezzled by the Navalnys. This case is being investigated together with another fraud case against the Navalnys, concerning Yves Rocher Vostok, the East Europe subsidiary of French beauty and personal care products manufacturer. Oleg Navalny is accused of having "manipulated" Yves Rocher Vostok into signing a contractual agreement for mail transportation with the Main Subscription Agency. The maximum punishment for this crime is ten years imprisonment. Alexei Navalny, opposition figure and corruption blogger, is also a suspect in a timber embezzlement case. According to investigators, in May to September 2009, Navalny, then a voluntary adviser to the Kirov governor, organized the theft of over 10,000 cubic meters of timber from the Kirovles company in collusion with Vyatka Timber Company Director Pyotr Ofitserov and Kirovles CEO Vyacheslav Opalyov. 11:17 18/04/2013 A new investigation has been launched against the Navalny brothers, Alexei and Oleg, the Investigative Committee reported on Thursday.